The home sauna has been gaining in popularity these days. This is because of the low price and simpler installation process. The affordable option, however, is the outdoor sauna as it is easier to integrate. Below is a quick guide to help you find the best outdoor sauna on the market. With all of these in mind, you might be asking what could be the best outdoor sauna units right now. Below are some of the top-rated saunas currently available on the market. A short description for each is also provided. Using Western Red Cedar for both the exterior and interior, Finlandia’s Outdoor Sauna is designed to last long even with continuous use. However, spacing might be a problem as the sauna kit offers only 2” x 2” seating with 3/8” spacing. This means spacing might become an issue if you plan to have more than 2 people in your sauna in one sitting. Finlandia uses Stone-based heating systems. This is great for those who prefer Finnish-style saunas. It also features a Fir Clear Glass that is pre-hung and is at 24” long. 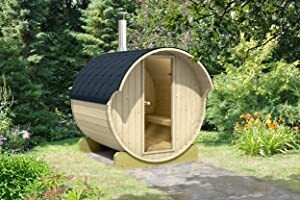 The barrel sauna uses stainless steel in the hinges, heater pipes, accents, and other hardware. It has a fairly durable interior compared to those found in any sauna available on the market. It can support 4 people in one sitting and uses Western Canadian Red Cedar inside and out. It features a system of synthetic support cradles on the bottom part of the barrel. This creates a space between the wood and the ground. This is what prevents unnecessary moisture buildup. The Allwood is one of the narrower barrel-type saunas. It is 67” long and has a 6’8” diameter. It can comfortably seat 4 adults. Also, its Nordic Spruce frame will ensure longevity despite repeated use. The Allwood uses the Harvia M3 wood fire heater. This is great for those looking for a traditional Finnish-style sauna experience. Like many Finlandia products, this unit uses a Western Red Cedar for the interior and exterior areas. It also has 2” x 2” benching and 3/8” spacing. This unit’s main selling point is its Starline Skylight Roof. It gives you a clear view of the night sky. The unit also has the Finlandia FLB sauna heater with stones. The sitting room might be smaller than other sauna units of the same price. However, it is easy to assemble and take apart. This feature makes the unit ideal for people who move once every few years. With a 6’6” diameter and 5’7” length, this is one of the widest outdoor sauna units to date. The frame is made up of 1-5/8” of Nordic Spruce. It allows the sauna to operate for several years before deterioration in the wood panels will show. 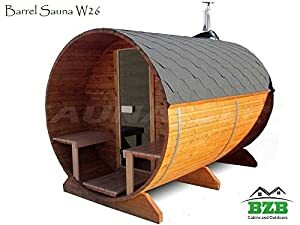 The barrel shape of the sauna requires 3 support cradles and steel bands with fasters. It will ensure that the unit is tightly held in place. It also uses a Harvia M3 wood fired sauna heater for even heat distribution. 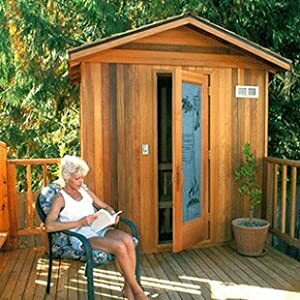 The right sauna for you should reflect your needs and budget. What is good for one person may not exactly be the same for you. To make this easier on your part, you should take a look at several factors before buying your sauna. How much time and money do you want to spend building your own sauna? 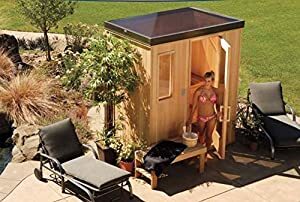 There are two types of outdoor saunas on the market today. These are the pre-cut and the modular models. The pre-cut sauna is built from the ground up by the manufacturer. By design, it can be used quickly after purchase. It has one problem, though. You will have to spend more in preparing the site for the sauna. Also, since everything has been built for you, you do not have a say as to how your sauna would look like. The modular sauna, on the other hand, is designed to offer mobility and customizability. Basically, you will have to buy the sauna piece by piece. Then, you need to install them one by one until you have a working unit. The best portable sauna units are usually of this type. This is ideal for people who tend to move frequently from one home to another. A sauna is basically a woodhouse, and the material used for it can affect the way you use it. The most popular sauna models in the West use a wood called Cedar. It looks attractive, does not decay easily, and does well inside the sauna’s steamy climate. Also, cedar gives off a nice aroma that makes the sauna a perfect place to relax. However, there are also other sauna models that use other wood. The traditional Finnish sauna uses a type of white spruce native to the Nordic regions. The wood material has a fine, white-tone appearance and is both light and durable. It also darkens slightly with age, which makes it resistant to constant wear and tear. Other wood materials include Abachi, Aspen, Redwood, and Hemlock. How many people do you want to fit in your sauna at any given time? The space inside the sauna can actually affect a lot of factors including heat distribution and overall comfort. The sauna should allow for at least 2 feet of breathing room for each bather. It should also offer a space of 6 feet in each direction to allow comfortable movement. Size will also determine the output of the sauna heater you will need. If you plan to fit more people in your sauna at the same time, you will need a more powerful heater. If you only plan for the sauna to fit a smaller number, then the standard heater units should be enough. Aside from the cost of materials and labor, you will have to think about how much the sauna is going to cost to operate. This will be determined by the kilowatt rating of the heater. The number of times you plan to use your sauna is also a factor. If you are planning to use the sauna on a weekly basis, you can expect it to have a big effect on your electric bill. Also, the rates used by your local electric company will affect operational costs. Find out how much each kilowatt hour costs in your area (which is noted in your recent bill) is before you decide on buying a sauna. Modern sauna units have gone a long way from stoking the flames and pouring water on a pile of hot rocks. Each unit comes with a control panel that allows you to set and store temperature preferences, as well as some other features. When picking a unit, choose the one with easy to use interface and a detailed map. Also, make sure that the panel has one feature: auto-off. This way, the sauna heater will turn itself off after a pre-set time to avoid accidents. 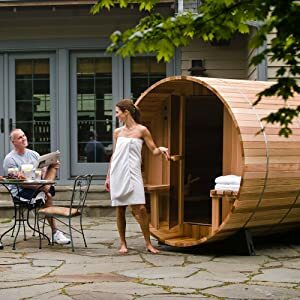 All in all, the title of the best outdoor sauna in the market currently belongs to Almost Heaven Saunas Audra Canopy Barrel Sauna. With its Red Cedar frame and stainless steel fixtures, it is the most durable both inside and outside. Its heater has a decent energy capacity that should be manageable for many homeowners. Lastly, the Audra Canopy offers the highest level of mobility. The frame is easy to assemble, expand, and disassemble. The unit might not be as good other barrel-type saunas like the one BZBCabins.com offers in terms of interior space. However, the Audra Canopy more than makes up for it with a sturdier frame, better moisture and heat control, and multiple opportunities for customization. Today, every investment needs to offer the best possible returns. These advantages can spell the difference.